Following a thrilling Connacht Minor Football Final, the children of Cumann na mBunscol Connacht played their part in what was a truly historic occasion in Elverys McHale Park. Children from all corners of the province lined out in the colours of Mayo and, for the first time ever for a Connacht Final, London. Adding to this unique occasion were the children of Seoul Gaels, also making their debut in a Connacht Final. 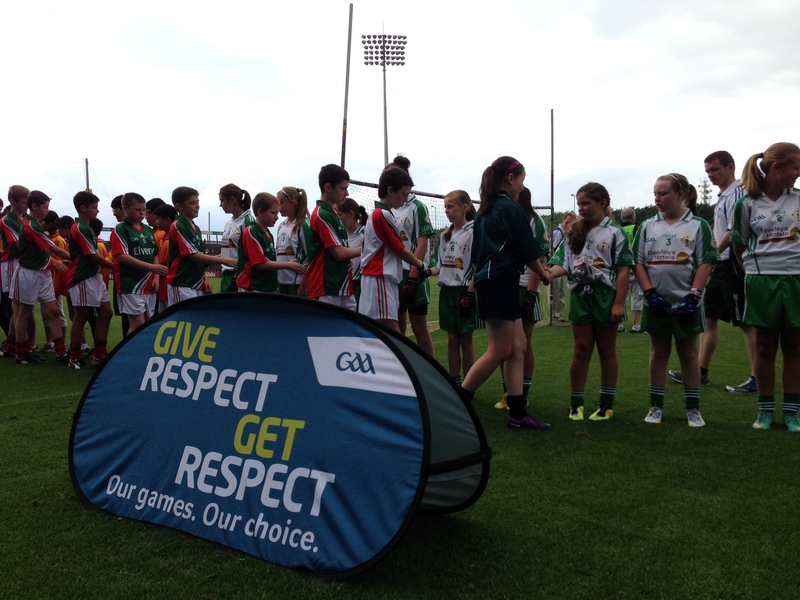 As has become customary in recent times, Cumann na mBunscol Connacht continued to promote the GAA’s “Give Respect, Get Respect” initiative, this time in front of more than 21,000 patrons. The children of Cumann na mBunscol Connacht lined up in front of the main stand, along with their new friends from South Korea for the traditional “Respect” handshake prior to commencing their exhibition games. Once more this year, the McHale Park crowd were treated to a fine exhibition of Cumann na mBunscol football. We witnessed some lethal finishing close to goal as well as some classy long range scores. The children displayed a great range of passing, tackling, blocking and fielding, all in the spirit of the “Give Respect, Get Respect” initiative, under the watchful eyes of our two “Young Whistlers” from Drumshambo and Drumcong National Schools, Co Leitrim. Meanwhile, the boys and girls from Seoul Gaels put on a wonderful display of all they have learned from Castlebar man, Conor Melvin and his colleagues on the Korean Peninsula. This Connacht Final was the first time a senior provincial decider involved a team based outside of Ireland. How long before we see an Asian based team on this stage? Following the exhibitions, all of the children gathered at the tunnel to welcome the senior football teams of London and Mayo onto the field of play. The children then had the honour of meeting An Taoiseach, Enda Kenny and Uachtaráin Cumann Luthchleas Gael, Mr Liam O’Neill who both took the time to greet the children as they stood in their guard of honour. This rounded off a fabulous, historic and unique occasion for the children involved. Thank you to the teachers from all over Connacht who helped make this such a special occasion and indeed to all the teachers throughout the province who do so much work for Cumann na mBunscol, promoting Gaelic Games in our primary schools. Also, thank you once more to Mayo Games Manager, Billy McNicholas, and his crew for their help in setting up the pitches. We are very grateful to the Connacht Council and all our County Boards for their wonderful support throughout the year. A number of children, both players and Young Whistlers, will now go on to represent their schools, counties and province during the Cumann na mBunscol exhibition games in Croke Park later this year. We know that they’ll do us proud and we wish them well. Sin a bhfuil don bhliain 2013!